One of the interesting aspects to come out of the 2008 financial has been that companies and specifically that senior management team’s and boards are trying to understand how they missed some of the underlying issues the crisis has caused to rise to the surface in their companies. This is often not because board has intentionally set about being reckless or having poor compliance procedures. In fact often it is the reverse and a board is genuinely surprised by what they find when a problem surfaces. 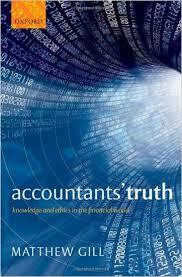 A useful book for examining this is Matthew Gill’s ‘Accountants’ Truth’. The interesting aspect of this book is the wealth of research that sits behind it, the author has spent as substantial time interviewing accountants in the audit industry to try and understand why it is that they can get things wrong and miss fundamental issues. Especially as at least to the outsider the process can appear on the surface to be a very clear cut and black and white process. While it is not possible to do justice to the whole book here it becomes apparent through the research that at every individual at every level of the audit process from the most junior trainee to the responsible partner at the top are making judgements calls on apportionment, categorisation and materiality to name a few. These collective judgements when taken as a whole can have far wider consequences than any one person appreciates, especially if the team as a whole is not aware of them and actively managing any bias. The stand out point for me is that the overall partner can through their approach to the client with their team cause a chain reaction that passes down through the layers to the bottom causing either completely unintentional bias or a bias that while intentional is far greater than they have perceived and yet will still sign off those decisions formally. In similar circumstances drawing from my own career, in a mortgage fraud I was working on a bank’s executive team created an internal competition culture between offices, each vying to write more business. This has the unintended consequence of one office lending money on a commercial space around the corner from another office. The problem was that it transpired that the property had been considerably overvalued because the surveyor had been bribed. The irony was that the office actually in the city would have been aware of this and would have picked up on the fraud far earlier. As it was the surveyor went on to give more bogus valuations and the bank lost a considerable amount of money. The lessons from both these situations are that boards as well as senior management need to have some understanding that their approach will always have unintended consequences, and that they need to actively manage the results of that. A positive and empowering boss will unintentionally cause their employees to seek more risk, a firm which prioritises profit and reward will create a culture whereby that is actively encouraged at the expense of other activities and so it goes on. The danger is that senior management having created that culture look to offset this risk simply by requiring sign off from a compliance department; neither of the examples above would be picked up by a compliance team because on the surface at least the proper protocols are being followed. It requires a much more nuanced appreciation of the business and ownership by senior management of the culture they create in an organisation. My challenge to the reader is to realise the unintended consequence that your behaviour will have today. PREVIOUSGender Equality: Why law can make a difference. NEXTWhy do we find difference so difficult?